I met Marielle 10 years ago, when she was working with the Commission for Human Rights in the Legislative Assembly of the state of Rio de Janeiro, alongside Marcelo Freixo. We met through friends in common, that also worked in the area of human rights. I’m a professor of Sociology at the State University of Rio de Janeiro. Marielle was a sociologist much like myself. She had a keen academic interest, and for those reasons she frequently attended my courses and investigative meetings. However, we were not just academic colleagues. We also became very close friends throughout those years. Marielle is a seed. Her legacy is an inspiration for all of us, and for those reasons women all over Brazil shout “fight like Marielle!”. In fact, after her death, thousands of Brazilians and people all over the world have gotten to know and love Marielle. Those who had the fortune of knowing her in flesh and blood know the power she held in her smile and her eyes, always open and always transmitting warmth. Despite being so special to us, she was a woman like many others: mother to an 18 year old, a working woman, a woman who fought to gain a university education. She was born into a family of migrants from the North East, one of the poorest regions of Brazil, and she was brought up in the favela Maré, a neighbourhood of Rio in which 140 thousand inhabitants currently reside. 1 in 5 of Rio’s inhabitants reside in its favela neighbourhoods, and it is in these spaces in which high levels of both inequality and potential are concentrated. 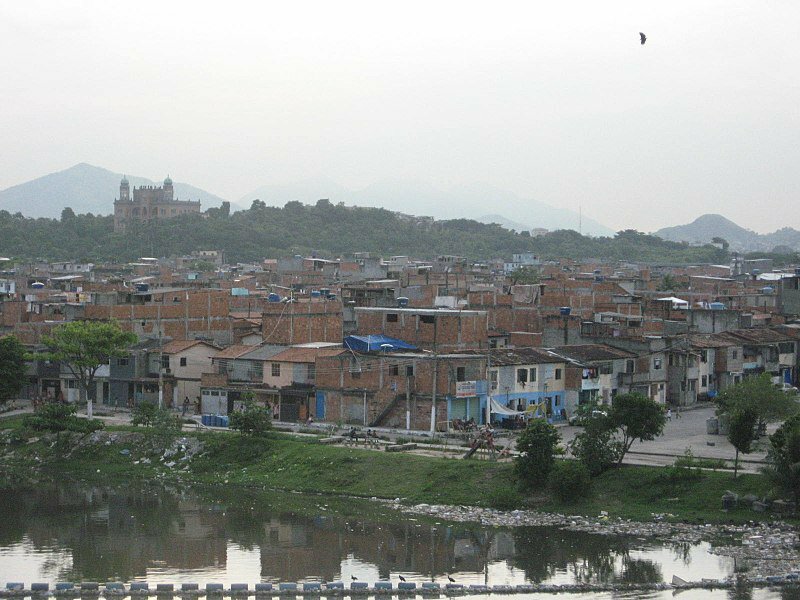 The favelas are heterogenous spaces, that tend to lack infrastructure, transportation services, health services, and schools. Despite their heterogeneity, Rio’s favelas are seen by a large section of Brazilian society as areas of poverty, social chaos, and crime. The inhabitants of the favelas are stigmatised and criminalised, as they have been for almost a century. The first favelas in Rio arose shortly after the abolition of slavery in 1888. Brazil was the last country in the world to end this terrible practice. According to the 1872 census, of the 10 million Brazilians who were living in the country at that time, 1.5 million were Africans taken with force from their home countries and enslaved. However, after abolition, the ex-enslaved afro population were never provided with integration policies. They suddenly found themselves unemployed and without anywhere to live. The majority moved to urban areas to take up informal employment in many cases as formal employers prioritised European migrants who recently arrived to the country. Without stable employment or places to live, the previously enslaved population began to occupy free spaces in the city, usually close to the hills and the peripheries of Rio, where they began to construct with wood, small houses that had no electricity or connection to running water. In 1888, Rio de Janeiro became the capital of Brazil and the city at this point had a large Afro-Brazilian population living in its favelas. According to the 2010 census, 66% of homes in the favelas of today’s Rio are Afro-Brazilian, meaning the inhabitants of the favela face a double discrimination: that of racism and classism. They are portrayed by many as invaders that have taken over the city. The favela Maré, where Marielle was born, became occupied around 1940. Some years later, the first ever Neighbourhood Association was created in order to improve the area. The history of the inhabitants of Maré therefore, is that of collective action and this is reflected in the personal journey of Marielle. It was collective organisation in Maré that led to the construction of streets, the installation of electricity, and other significant developments for the neighbourhood. It was also the collective organisation of the inhabitants of Maré that created in 1988 the community ‘Pre-Vestibular’. The ‘Vestibular’ is the yearly exam which those who wish to enter into university must take that will determine their academic future. It practice it works as a filter that impedes the entry of many public school students into good public universities. In comparison with students from private schools, disadvantaged public school students struggled to make the cut, due to the lack of preparation they often received. Today, higher education in Brazil continues to be exclusive for the children of the upper and middle classes due to public education’s failure to prioritise the ‘Vestibular’ exam in their curriculum. This is why initiatives like the ‘Pre-Vestibular’ of Maré arose, in an attempt to provide a chance to those from a disadvantaged background, so they could enter university. The courses relied on teachers with connections to left-wing political movements and social movements, that would engage their students in profound political debates and would explain the many causes of injustices and inequalities to their students. Marcelo Freixo, the State Deputy that worked with Marielle in the Human Rights Commission of the Legislative Assembly of the State of Rio de Janeiro was a teacher for the ‘Pre-Vestibular’ of Maré. He and many others created this course, and the initiative spread to other favelas in the city, becoming an unstoppable social movement. Marielle was already 23 when she entered university, she had a small child, she was working as she had done from the age of 11, but it was an experience that opened up a whole new world to her. Marielle was a student of the ‘Pre-Vestibular’ course of Maré in 1998, after the birth of her daughter Luyara. When Luyara was born, Marielle was only 19 years old. She had left school and decided to take up studying again in an attempt to enter into university. After a few attempts, Marielle was accepted into the Social Sciences program of the Catholic University of Rio de Janeiro, with a grant for students from Maré. Her university experience therefore, was not that of the other students. She was already 23 when she entered, she had a small child, she was working as she had done from the age of 11, but it was an experience that opened up a whole new world to her. She affiliated herself initially to the PT, the Worker’s Party of Brazil, later switching to the PSOL, the Socialism and Freedom Party, for which she was elected councilwoman in 2016. Her militancy, even before aligning herself to political parties, was always in the area of human rights. For the inhabitants of the favela, the fight to secure their human rights is fundamental, because it’s a fight for their own survival. Aside from economic inequalities, inhabitants of the favelas face a daily fight for their lives, living in the most violent areas of the cities where the Brazilian State exercises its iron fist over its people. Favelas are seen by the Brazilian people as hiding places for criminals and the city’s marginalised, therefore the idea that police can open fire on their inhabitants is justified by this stigma. In Brazil, the police force that come into the most direct contact with the population is the military police, and the inhabitants of the favelas are treated by the military police as enemies. This justifies the military operations taking place in favela territory, with the use of war tanks and heavy artillery. As these are spaces generally considered to be on the margins of the law, police operations there have been characterised by illegality and a lack of discretion. It’s common for civilians to die in the crossfire during police operations in the favela. As these are areas in which there is often very little state presence, they have become operational headquarters for drug traffickers. These traffickers throughout time became a strong local presence that suppress the inhabitants of the favelas into submission through the use of violence. Since the 80s, the drug gangs have occupied a considerable space within the favelas of Rio, controlling the daily lives of those who call them home. Police repression in the favelas began to increase around that time as part of the war on drugs that has affected almost the entire region. Therefore, for around 40 years the favelas have become war zones where two unforgiving forces battle each other at the expense of those who live there: the military police and the drug traffickers. Rio de Janeiro’s military police is particularly violent: in 2017, in an agreement with the Brazilian Public Security Forum, 5144 persons died as a result of political actions and out of those, 1127 took place in the state of Rio de Janeiro (whose population of 16,72 million represents 8% of Brazil’s total population). Indeed, many inhabitants of the favelas have lost their friends and family members on account of violence from traffickers, police forces or in confrontations between the two. The case of Marielle Franco is no different: as an adolescent she lost a friend who was assassinated in Maré during a clash between the police and narco traffickers. The pain and indignation she felt over the death of her friend were fundamental in connecting Marielle to the world of politics. In 2006 the Socialism and Liberty Party (PSOL) launched Marcelo Freixo as a candidate for state deputy under the banner of promoting human rights. Marcelo, a history professor in schools and the pre-vestibular course of the Maré, was a local activist that initially worked with prisoners and their families helping those whose sons and daughters were assassinated by the Rio de Janeiro military police. Marielle joined Freixo’s campaign in Maré and was afterwards asked to form a part of his cabinet and participate in the Human Rights Commission, which he presided over. Marielle’s work was essential for the Human Rights Commission. She traced cases of massacres and political executions, provided legal and psychological support to families and demanded that the authorities speed up their investigation processes. While at the Commission, she also worked with the families of the military police that died while serving in order to ensure that their deaths were properly investigated and their families protected in accordance with the law. It is during this period that Marielle positioned herself as a human rights activist and her candidacy began to take shape. Marielle worked with Freixo between 2006 and 2016, when he ran as a candidate for mayor and she ran as a candidate for a councillor for the first time. Her campaign constituted a fundamental frame of reference for the political history of the city. As a woman, a black person, a favela resident and a human rights activist, she gained the support of various different groups - favela inhabitants, intellectuals, various black movements, women, university students - who saw in Marielle a candidate that was drastically different from the others and as such presented an opportunity for a new kind of politics and with it, a new kind of world. 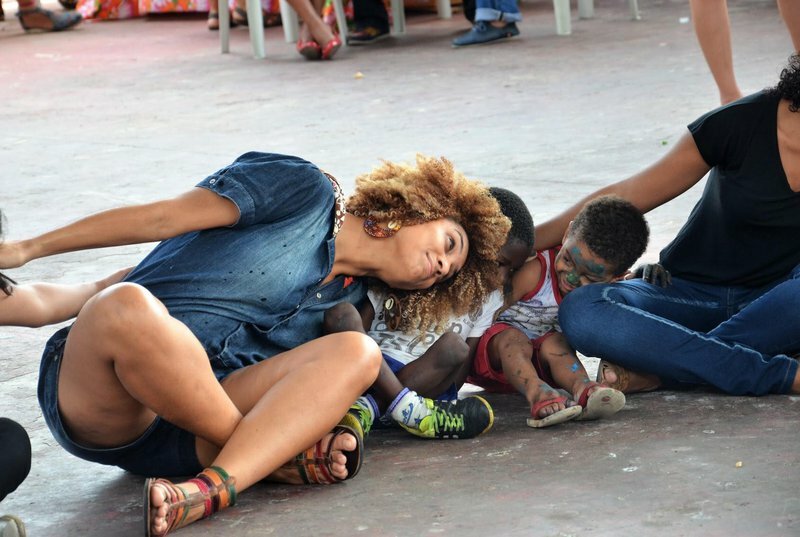 Under the motto “I am because we are”, Marielle’s campaign articulated important ideas of unity, representation and the possibility of having a political actor unlike Brazil’s traditional political players. Out of the 51 councillors elected in 2016, only six were women and just one, apart from Marielle, was black. The change that we wanted to see in our institutions was embodied by her. Marielle was different from them, but she was like one of us: she came from struggles, social movements, black university collectives, Carnaval groups, funk artist culture. She represented a different way of living, circulating the city, being engaged in politics, of fighting. The night that Marielle was elected was one of the happiest nights of our lives. Brazil’s 2016 political context was fairly different from today’s, particularly in Rio de Janeiro. Although the city was governed by right wing parties for over 30 years, in 2016 a leftwing candidate won 40% of the votes for mayor’s office. PSOL elected four councillors in the party’s most meaningful vote thus far. One of the councillors was the second most voted in the city. And Marielle was elected in a surprising vote of 46.502 votes, making her the fifth most voted for person in the city and the second woman with the highest number of votes. Marielle Franco presided over the Commission for the Defense of Women in the Rio de Janeiro chamber and brought the issue to legislative debates. Her work, together with the PSOL, was also fundamental in enabling the party to denounce various corruption schemes. Her period as councillor was marked by a strong emphasis on the rights of women and the situation of populations living in favelas. 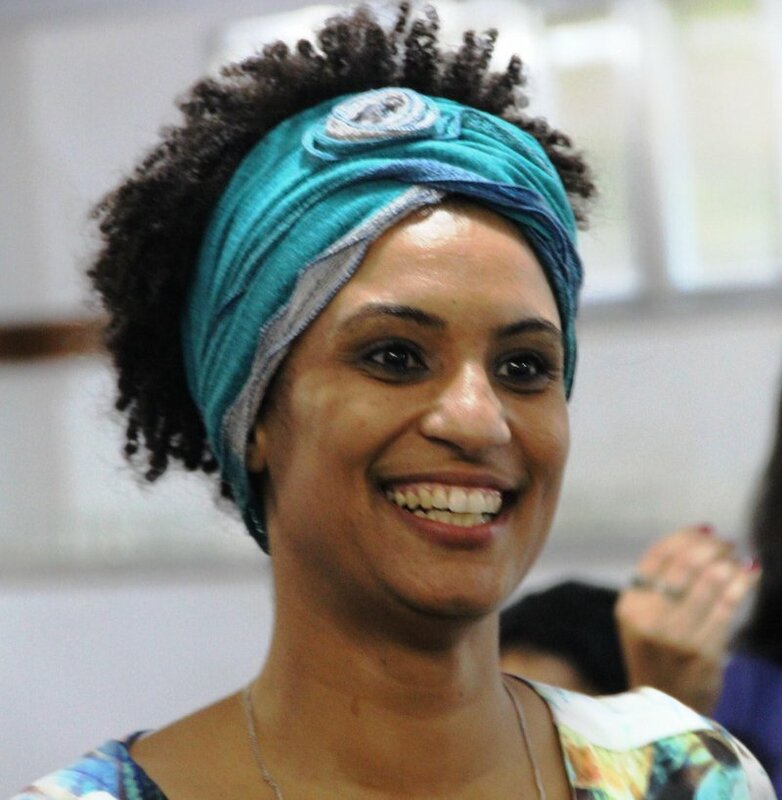 Marielle Franco presided over the Commission for the Defence of Women in the Rio de Janeiro chamber and brought the issue to legislative debates. Her work, together with the PSOL, was also fundamental in enabling the party to denounce various corruption schemes that existed in the city linked to the mafia in control of the public transport system as well as the contractual and construction companies involved in constructing stadiums for the World Cup and the Olympic Games. The speeches she gave at the plenary always had a big impact, but, as a councillor coming from an opposition and a minority party, Marielle always encountered difficulties in achieving the approval of laws. Out of the 16 bills she proposed while serving as councillor, seven were approved with five passed only after her death, including: the regulation of the work of ‘motorcycle taxi drivers’, very common in favelas; fiscal instruments ensuring the control of contracts made by the mayor’s office; night-time nurseries for children of families that work or study during the night; the creation of the Day of the Black Woman and Tereza Benguela on the 25th of July; a campaign against the violence and harassment of women, particularly in schools; the Dossier Women’s report that contained official information on violence against women; and a program centred on social reintegration of young people in conflict with the law. Voted on, although not approved, were also a bill that would create a technical assistance department for housing construction in favelas and the creation of a Day against Homophobia, Biphobia and Transphobia. The struggle for LGBT rights was not a prominent part of Marielle’s activism, but the theme rose to importance after she publicly declared her relationship of more than 15 years with the architect Mónica Benício. The two met in Maré where they already participated in the same activist circles but only began their relationship in 2015. Even myself, who was very close to Marielle, was unaware of the length and the intensity of her relationship with Mónica. For Marielle, as for the majority of Brazilian women, machismo and the patriarchy are strong barriers preventing women from living their complete emotional and sexual experiences. Hence, as a black woman, a favela resident from a traditional catholic family, a mother and an ex-wife of two men, it was very difficult for Marielle to publicly present herself as a bisexual and a lesbian. However, after many years of being separated for fear of how her friends and family would react, and after some time of keeping her new relationship a secret, the two began to live happily together with Marielle’s daughter and even began to plan a big wedding for the year ahead. Although the period in which Marielle worked as a councillor was marked by her valiant and vibrant conduct, the situation in the city of Rio de Janeiro began to worsen and is, as of today, even worse than when Marielle was elected in 2016. When President Dilma Roussef was impeached that same year, the repression and the arbitrary acts of the Brazilian government only intensified. Although the experience of poor and black people in Brazil has always been marked by violence, inequality and injustice, after the impeachment - more appropriately defined as a parliamentary and judicial coup - the situation got even worse. In February 2018 the government of Michel Temer, who came into power after Roussef was overthrown, ordered a federal intervention in the state of Rio de Janeiro. In an official announcement, Temer declared that the objective of the intervention was, “… to put an end to the grave situation of public order” in the state. As part of the decree, the government appointed a general in charge of intervening in the state, who received federal authorisation to break the norms of the state perceived to be in conflict with the measures necessary for the advancement of the intervention. With this measure, President Temer, who had very low levels of popular support and enormous difficulties in passing equally unpopular reforms such as the Pension Reform, changed the focus of his politics. The issue of security, as we are well aware, mobilises hearts and minds through fear. And it is this fear that allows the arbitrary acts of the government to be tolerated and even advocated for by the population. These were not isolated events in the recent history of the state of Rio de Janeiro however. 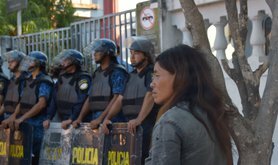 In 2018 the state just completed a decade-long experience of living under the Pacifying Police Unit (UPP), a government initiative carried out in 38 favelas cariocas, directly affecting the 1,5 million that live there. The UPP’s programme, which began in 2008, consisted of a permanent military occupation of particular favelas by the military. 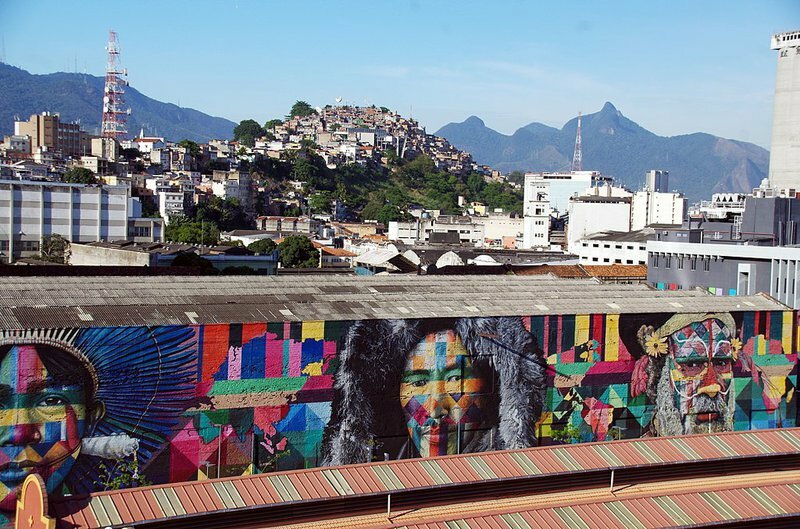 Since the 2013 repression of mass political manifestations across the country, we in Brazil have been intensely experimenting with the transformation of city spaces into sites of battlefield, moving beyond the frontiers of favelas and peripheries. The “war on drugs”, which has in reality always been a war against the poor and the people living in favelas, has strengthened its military character. The army occupied the Maré favela for 14 months. According to the Ministry of Defense’s webpage, “for the militaries, the occupation of la Maré is considered a modern conflict. An irregular war, without borders, against a dispersed enemy.” In similar fashion, the programme of the Pacifying Police Unit, although based on the same principles as the regular police, announced the repressive measures as part of social programmes, and effectively amplified the dynamics of control used over the residents of occupied areas. Favela associations were violently repressed during the military regime and, despite having experienced a major renaissance in the 1980s and 1990s, they have been suppressed ever since. Militarization has deep historical roots in our country. Between 1964 and 1985 the country lived under a ruthless military regime, where civic and political liberties were significantly compromised. n this sense, our democratic experience is recent and therefore fragile, especially in terms of organizational possibilities and political participation of favela inhabitants. Favela associations were violently repressed during the military regime and, despite having experienced a major renaissance in the 1980s and 1990s, they have been suppressed ever since. The growth of militarization as a governmental method in the country’s poor regions represents a risk to their participation in the reconstruction of Brazil’s democratic regime. The 2018 presidential elections were mobilized by polarization. Jair Balsonaro, a former army captain, defends the actions of the Armed Forces during the military dictatorship. His allegations are also supported by his vice-president and other members of the government. They belittle the fact that during the dictatorship more than three thousand citizens in Brazil were murdered, out of which at least 500 cases were recognized by the State as political disappearances, and where thousands of people were imprisoned and illegally tortured. 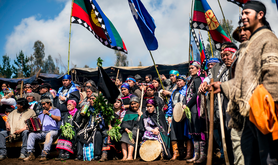 Recent investigations identified the extermination of more than 500 indigenous people, unrecorded deaths aside. It was also during the military dictatorship that more than one hundred thousand favelados were violently expelled from their homes and relocated to distant places where there is no urbanization. These violent acts often go unnoticed, presented as the inevitable costs of modernization and of creating order in the country. This ideology is becoming increasingly hegemonic in Brazil today, and it was against it that Marielle rose up. 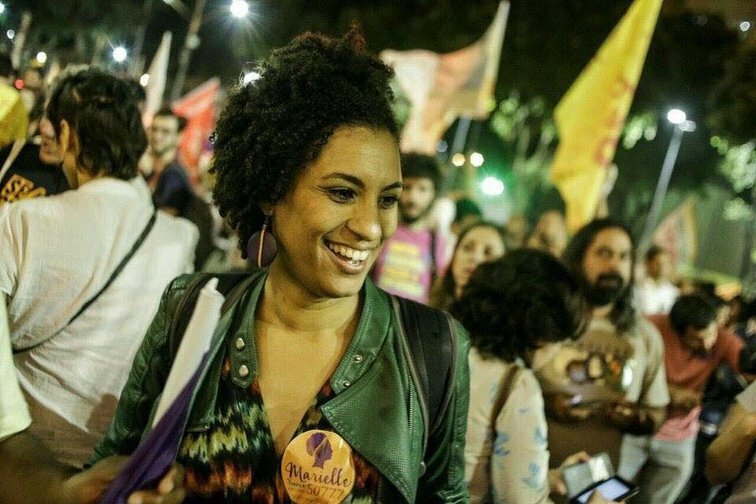 As a result of her Human Rights militancy, when the federal intervention was decreed in Rio de Janeiro, Marielle became one of the four councillor rapporteurs of the House Committee to accompany the Federal Intervention. 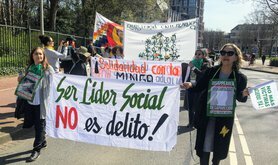 The Commission's work consists of gathering information on the development of operations, articulating initiatives between the state and civil society, and denouncing abuses and arbitrary behaviour. However, after Marielle's execution, little has been heard about the commission's actions. Former President Michel Temer used Marielle’s death to justify the intervention’s continuation, despite her position from the outset against the intervention. According to her, it had a lethal potential against the favela population. Evidently, Marielle would be against federal intervention. Her master's thesis, which I had the pleasure of being part of its academic jury, discusses the social roots that legitimize the favelarios’ submission through the analysis of the Peacekeeping Police Units (UPPs) project. Recently published as a book, her work presents popular resistance and alternatives to produce a different public security which considers the livelihoods of this huge cohort of Brazilian citizens, of which Marielle was part of and for whom she stood as a representative.  Her contribution can be found in the evaluation of the "pacification" policy still in operation, characterizing both its temporary and precarious character as well as its effect of poverty criminalization. Marielle's work also contributes to understanding the overlap between the militarization of these territories and the economic changes observed in the city of Rio de Janeiro, both in terms of the adoption of neoliberal policies, as well as the impacts of events - such as the real estate speculation that affected the favelas’ surroundings with UPPs. Thus, the political attack against PSOL councilwoman Marielle Franco and her driver Anderson Gomes is perhaps the most terrible expression of this so-called war we are experiencing Brazil, which promises security but brings more death and authoritarianism. Marielle was executed on the night of March 14, 2018, with four shots - three in the head and one in the neck. Her driver, Anderson Gomes, was also a victim. Investigations to date, a year later, have been able to identify who killed Marielle, but not who had her killed. We know that in the week in which she was executed, Marielle had denounced the arbitrary action of two policemen belonging to the Military Police Battalion. She accused them of various crimes, including belonging to a militia group. Militias are groups of soldiers or former soldiers who offer illegal security services to residents of specific places, who, if they refuse to hire them, are potentially harassed, assaulted and even killed. Militias also exploit services such as fuel and transportation, charging higher amounts. Their involvement is also known in politics, since several elected parliamentarians from the Rio de Janeiro state were identified as belonging to these militias. When Marielle worked with Marcelo Freixo in the Human Rights Commission, they were responsible for an important investigation into the militias, which led to the arrest of 250 militiamen. According to press information, not verified by the police, Marielle's fellow councilors and Freixo's fellow state deputies are being investigated as the intellectual authors of the crime. Everything indicates that Marielle was executed in order to silence her and bring to a halt her struggle in defense of the rights of favela inhabitants, women, black people, and the LGBT+ community. Everything indicates that Marielle was executed in order to silence her and bring to a halt her struggle in defence of the rights of favela inhabitants, women, black people, and the LGBT+ community; that is, of the exploited and debased working class. We also know that a councilwoman who was black, lesbian, favelaria, and who spoke up and argued with men as equals aroused the hatred of many people. Some time ago, for example, Bolsonaro supporters broke a plaque in homage to Marielle displayed in a public square in downtown Rio and publicized the act on social media. Until today this brave woman awakens the anger of the powerful, the racists, the machistas. However, Marielle does not only stir hatred. Marielle's death also provoked sadness, indignation and the desire to continue her struggle. We are now transforming our pain, our mourning, into struggle. Thousands of people took to the streets to demand justice for Marielle and Anderson. Demonstrations took place all over the world. Marielle was honoured by various schools, universities, mayors, cultural collectives. In this election there were several candidates who presented themselves as seeds of Marielle. Her family - her mother Marinete, her father Antonio, her sister Anielle, her daughter Luyara and her wife Monica - are now activists like Marielle. They travel the world denouncing her murder and demanding justice. On September 29, millions of people took to the streets of Brazil against fascism, represented by Bolsonaro's candidacy, and Marielle's name was sung and shouted by everyone. Especially by the women present, who organized and played a leading role in the demonstrations. At this moment of barbarism, we do not know what the future holds for Brazil. The candidate of hatred has won, and the snake’s egg has already been incubated. Human rights and democratic freedoms are at serious risk. The life of the inhabitants of the favelas, which has never been easy, may become even worse. But we will not give up. Marielle Franco will not be silenced. They won't silence us. We will continue to shout, denounce her death and demand justice. Justice for her and for so many Brazilians, who are disrespected, violated and massacred. We will continue to fight. To fight like Marielle Franco.